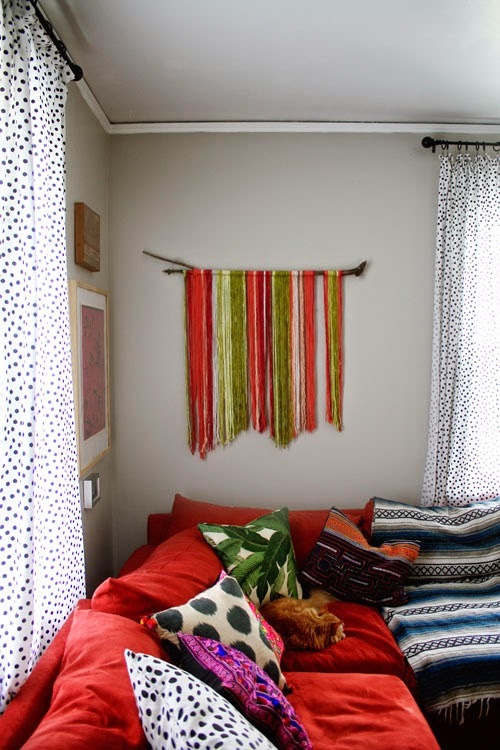 Weaving and macramé are big in a big way this year. Yarntastic textiles made by hand, rich in bohemian colors and patterns, harken back to 1970’s days gone by. 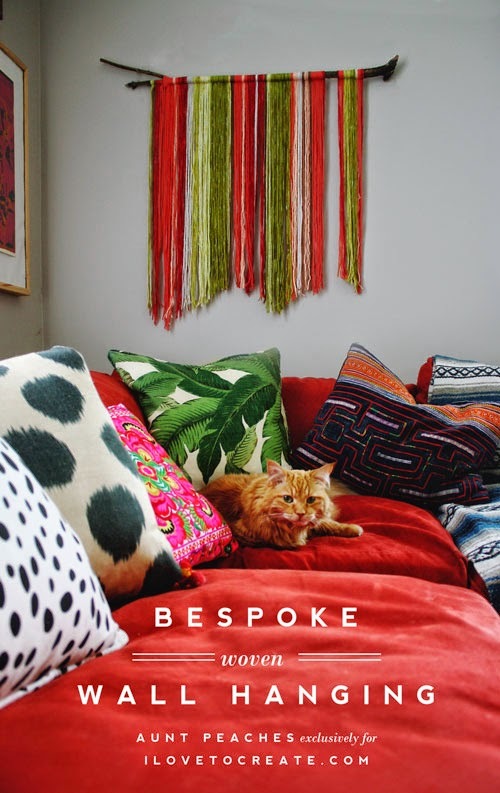 But don’t be fooled – this isn’t your grannny’s macramé; instead of spending hours and hours memorizing confusing knot patterns, this time around we are bringing in the handmade touch with color. Vibrant, custom, one of a kind color. Thanks to Tulip’s dye powders, it’s easy to mix and match endless shades of your favorite span of the color spectrum. You ready? Lets get started! Tulip Fabric Dye. 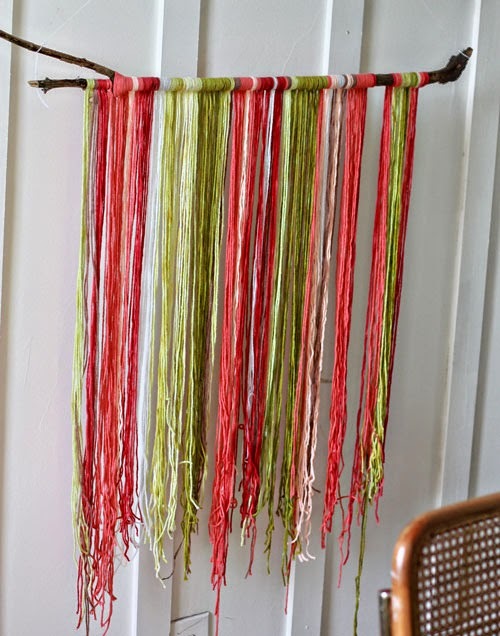 For demonstration purposes I am using green, but I suggest you use at least two different shades of dye, then mix and match your own color formulas. Tulip carries several variety packages of dye as well. Natural fiber yarn. Must be cotton or wool, etc., no more than 20% acrylic. Can be white, or use a pastel color as a base layer for your dye later on. Glass jars or disposable cups. Start out by creating small bundles of yarn by loosly wrapping the yarn around your fingers 100 times or so, then tie off with a bow. Be sure the bundles are secured tightly as it will prevent the bundles from becoming entangled when submerged in the dye bath later. To begin, create two dye baths of different strength, beginning with two cups of water in each container. 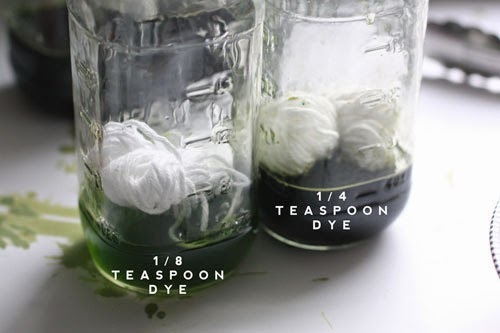 To one container, add 1/8 teaspoon of dye, to the other 1/4 teaspoon. Mix thoroughly. 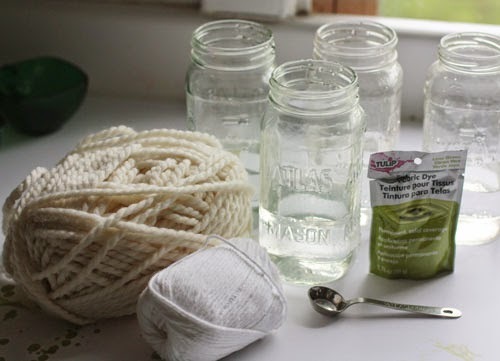 Submerge a bundle of yarn in each container and let it soak for 30 minutes. Remove it, wring it out, then let it dry (you may find a dish rack allows for excellent air circulation). You see where this is going? By adding more or less water to the dye bath, you will vary the intensity of the color. The possibilities are endless. ...but don't limit yourself to just one color. Add more colors, then mix them together. Blue + Green = turquoise. Green + red makes a lovely chocolate brown. Pink + yellow = Peach. You get the idea! 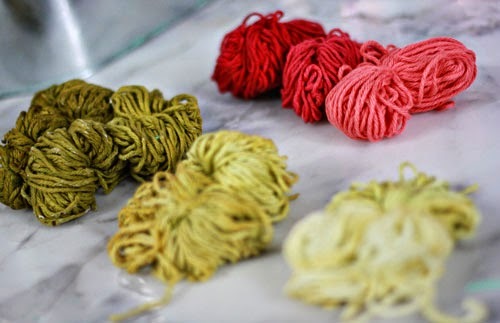 A very small amount of dye will provide endless colors of yarn. The key is variety. 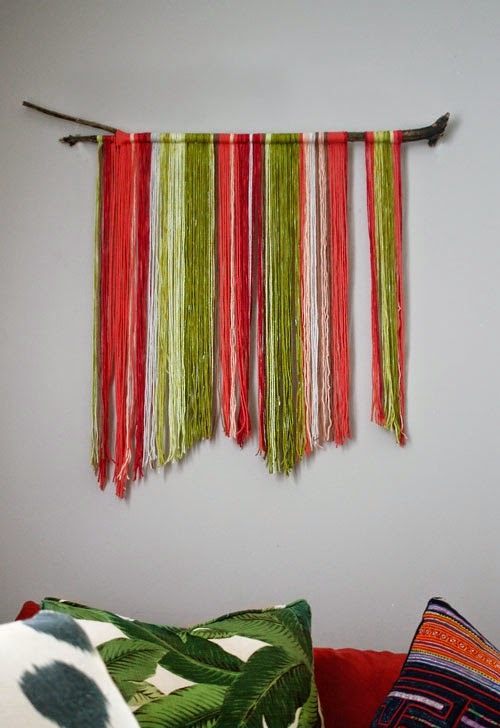 When you have enough yarn to do one hanging (roughly 200 yards here), untie the bundles and cut strands of yarn twice as long as the desired length of your wall hanging (60" here). Now for the weaving! It is deceptively simple. 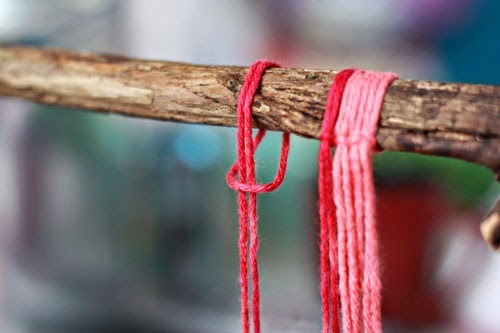 Just fold the strand of yarn in half, lay the 'bend' over the branch, then pull the two loose ends through. Then repeat. And repeat. Group color waves together, then alter at random. Five light green, two medium green, seven dark green, and so on. Eventually patterns will begin taking form and you will start to see ombre-like stripes. Nifty! 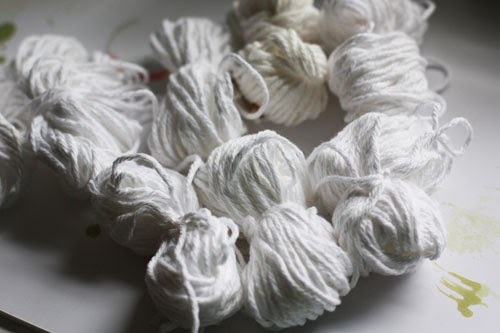 If you find your yarn is "crimpy" from drying in bundles, spray it with water and let gravity straighten things for you. When it is straight, use your sharpest pair of scissors to trim a jagged line along the bottom edge. 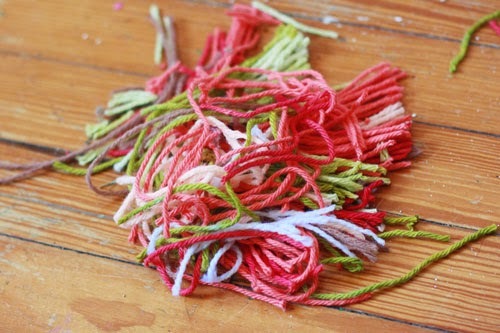 You know, you could do something cool with these yarn scraps. Insert two nails into the wall and perch the branch on top -- no special hangers required. Now wait for your neighbors to be impressed. Look at you. So Bohemian!